The Doussard Downwind Dash « Alptitude! Dennis & Rozi, doing the Doussard Downwind Dash! We went to Annecy today. Following a happy VW camper en route! Nice to have a trip out and a change of scenery. 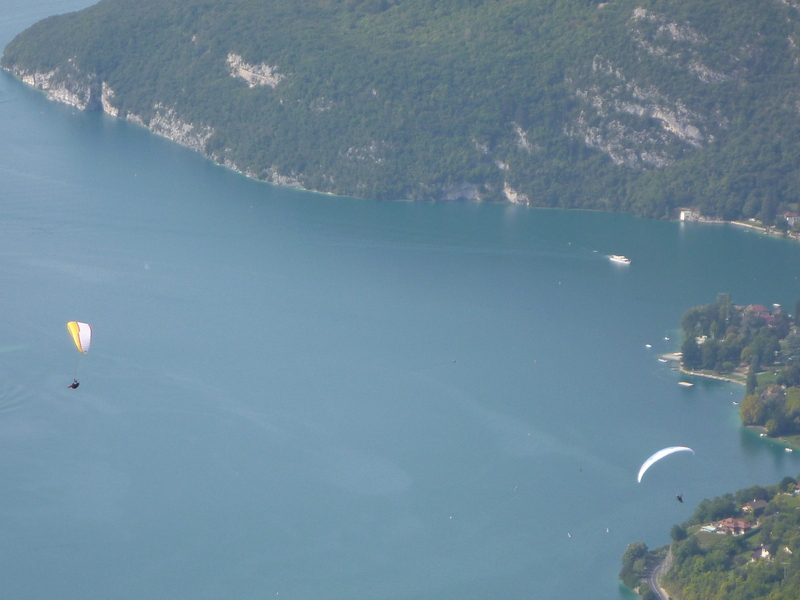 This time of year, the charm of Annecy still remains although the pilot numbers are much fewer, the thermals much more scarce and the xc’s (today) were non-existent, well it seemed so. We went up to Montmin, they’ve done a lovely job up there now, it always was good but it just got better. With a terraced area, w.c’s, parking all very accommodating. Conditions were stable and as it started to improve a high white cloud shield arrived putting swift closure on any hope of air acitivity. Dennis and Rozi had a desperate scratch to get some sort of anything, abandoning the challenge before completly running out of glide steam and headed for Doussard. Meanwhile, I had a nice walk with Tizzy then drove down. I did however get to sit in an Advance Impress 3… in fact, I didn’t really sit in it, I was engulfed in the the thing! more like a tent… could have fitted a kitchen in there with me! Admittedly, it was a large but I just wanted to have a play… Michel Ferrer showed up in Les Passengers du Vent, shop we had a little chat..as he was thumbing through this months action packed XC mag! It was a day out… which is always nice.